Confused which CB radio to buy? This Cobra 148GTL review is perhaps the right choice. Let me tell you why. The brand is known for its durability and frills-free capability. Not just that, it also has long-range SSB capabilities. I hope you will find answers to all the questions about this product in this post. Cobra is a company known for its quality CB Radio and walkie-talkies. They have brought back the original 148 GTL CB radio with some innovative touch-ups. Aside from 40 standard CB channels it also has 80 SSB channels and several other great features. I find these features very impressive and helpful for users. Can reach longer distance to share your broadcast. It is bigger as compared to other brands. If someone would ask me, is this product worth buying for? My answer is a big YES. With improved Cobra 148 GTL you are assured of a durable and reliable CB radio. This product is designed for individuals who want the benefit of long-range SSB communications in a reliable, robust, no-frills CB radio. It is recommended to be installed in commercial vehicles, pickups, and semi-trucks. 12 watts SSB RF power output that boosts range capabilities. Its 4-pin front panel mic connector enables the 148 GTL to be set up above, under, or in-dash easily and conveniently. Dual conversion AM receiver made to maximize frequency response and image rejection. The tactile controls enable you to check if the dial is in its rotation without taking your eyes off the road. It has built-in SWR calibration and SWR meter control for precise matching to the antenna. With Dynamike microphone for optimum clarity on transmit. It has a noise blanking switch to reduce the noise received. The company offers a one-year warranty on the parts. Cobra 148GTL is compatible with all CB antennas on the market. One can install it to any flat surfaces using “U” mounting bracket. These are some of the features which makes Cobra 148 GTL popular. Below are some Cobra 148GTL reviews from the actual user of the CB radio. JT from New Jersey is one of the satisfied users of Cobra 148 GTL. He can attest to how excellent the stability of SSB is. This is due to the analog components like variable resistors and inductor inside. It can also improve the clarity and sound of your voice. Thus, if you are aware of the primary purpose of using this product, you will be more than happy you purchased it. According to another user Danny, the Cobra 148GTL he bought from Amazon receives signal well, and the sound of the speaker is very clear. He also has no problem mounting and disconnecting the CB. James was also satisfied with the Cobra he just purchased. He considered it as one of the best radios he ever owned. According to him, it gets better as he tweaked and peaked. It is best if you match it up with a quality antenna for better results. However, there are also some who are a bit disappointed with the product. Some of their complaints are all frigged up. It sometimes works well and sometimes not. Other issues are damaged items, transmit audio terribly and other delivery issues. Q: What is the difference between Cobra 148GTL and Cobra F 148GTL DX? A: The Cobra f 148GTL DX has extra frequencies and FM from the factory. Q: Where can I buy the unit? A: You can check Amazon.com and other online stores. Don’t forget to compare the price. Q: What is the purpose of RF gain control? A: The RF gain control is used to lessen the gain of the RF amplifier under strong signal situations. Q: What to expect on controls and indicators? A: Cobra 148GTL has 13 controls and 3 indicators found on the front panel. You can use these controls to adjust the volume of the CB radio. Q: How will Cobra 148GTL operate in SWR? A: This product will operate in an SWR of two to one indefinitely and keep an SWR ratio of 20:1 for about five minutes at rated operating conditions. Q: What is the function of SWR Meter? A: It is used to monitor the quality of the coaxial cable including all the RF electrical connections. SWR meter adjust the length of the antenna appropriately. Once you have identified the most convenient location, hold the Cobra 148 GTL with mounting bracket in the chosen position. Then remove the mounting bolts. Attach the antenna cable plug to the regular receptacle on the back panel. Connect the red DC power input wire to DC. Mount the mic bracket on either side of the transceiver. The package includes two screws. If installing in an automobile, put the bracket under the dash to make the mic readily accessible. 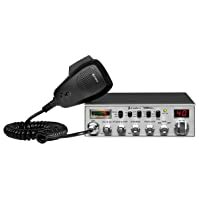 Cobra 148GTL 40 channel is the best CB radio recommended to those who are after the benefits of the long-range SSB communications. As a fan of CB radio, I find this brand impressive, and the features are outstanding. I highly recommend this product. Hope this post helps you determine if this radio will fit your automobile or not. If you find this Cobra 148GTL review helpful to you, feel free to share this post with others. You can also comment below.